I took (am taking) a little Leave of Absence from my responsibilities of Creative Teams and the Scraps Matter Gang for the week. I actually started my LOA on Tuesday morning (right after sending out my last post) and will resume on Friday evening. I'm taking my children (the younger 4) to the zoo on Saturday, if the weather is nice, so I'm not sure how much time I'll have for creating then either. Anyway, just wanted to say that in doing that I've got so much done - mostly just in my head - clearer thinking and time with the Lord. It is so refreshing! As a side note, I'm working my way through the book Homeschooling at the Speed of Life. It is really wonderful and would help any mama who desires organization but also struggles with a brain that runs ninety to nothing. It comes with a CD full of forms to help you get organized and I'm using my Mead 3 ring flexi-binder to put everything together. I would love to get a Levinger Circa notebook, but it with have to wait until this other thing breaks or I get too frustrated to deal with opening those little rings everytime I want to add something. It's not like a regular 3 ring where you just pop it up, you have to open the rings individually. I hear the baby calling out for mama - so I better go! Oh, got up at about 5:30 this morning and I feel so accomplished already!!! I spent time studying Proverbs 31!!! I'll leave you with this passage that we hear so often, but yet is so profound. I couldn't possibly update on everything that has taken place in our lives since my last post more than 10 days ago, so I'll try to sum up with my Project 365 Layouts and a couple of highlights. We learned about God's true calling for women and watched 3 sessions of the True Womanhood '08 conference. We also learned about the roots of feminism which was very interesting. Also interesting is how some of those thoughts are so ingrained in us. Although these are not new messages for me, the fact that I was hearing them with the ladies that I go to church with weekly, fellowship with, and study alongside, was so wonderful. It's great to know that these ladies are on the same page with me and that we all want to be pleasing in the sight of the Lord. We culminated the retreat by hearing about the new study for the year. We will be studying Taking Time to Quiet Your Soul. We also had a chance to have some quiet time with the Lord. My roommates and I had a wonderful time and finished the weekend off with some shopping at Bass Pro Shop and eating at Fuddruckers. Yummy! Here's my recent Project 365 Layouts. You can see closer versions and credits for everything in my gallery at Scrapmatters. Gonna keep this short - don't I always say that?! We had our homeschool valentine's party today and it was such a blast. I had kind of spear headed it, but without the help of all the trustworthy mamas in our group, it would have flopped for sure! And my incredible hubby is just as incredible as ever. Baby A stayed with him almost the entire time and he was one of the group leaders herding a pack of children from one station to the next. He is simply incredible! Everyone had a part and played it well. The children all had a fantastic time and I can't wait to upload the pics that I tried to snap in between all that was happening. We are home and about to enjoy the lasagna I had put into the crockpot before we left. Sleep Experts delivered our new bed today. Woohoo!! Can't wait to sleep on it tonight. I'm so excited! About going to sleep?! Can you believe it? And I got a Valentine's present early!!! Some beautiful new earings from James Avery!!! I'll try to get Big P to take a pic of those in the morning. They are beautiful and so me!! He also gave P.9.G. a pair of little heart studs from JA. They are so sweet and dainty! I shared a story at our party about St. Valentine and I wanted to share it with you all. I then made a little valentine for each of the children with John 15:13 on it for them to remember what Valentines is really about. Many years ago I read a story about St. Valentine that really caught my attention. And I want to pass it on. In the Bible John 15: 13 reads "Greater love has no one than this, that one lay down his life for his friends" And that is just what St. Valentine did. St. Valentine was a priest near in about the year 270 A.D. At that time the Roman Emperor was imprisoning Christians for not worshipping the Roman gods. During this persecution Valentine was arrested. Some write that he was arrested because he was performing Christian marriages, but others say it was for helping Christians escape prison. During the trial they asked Valentine what he thought of the Roman gods Jupiter and Mercury. Valentine said they were false gods and that the God that Jesus called Father was the only true God. So the Romans threw him in prison for insulting the gods. While in prison Valentine continued to minister. He witnessed to the guards. One of the guards was a good man who had adopted a blind girl. He asked Valentine if his God could help his daughter. Valentine prayed and the girl was given her sight. The guard and his whole family, 46 people, believed in Jesus and were baptized. Because these people had come to know Jesus, Valentine praised God right there in his prison cell. When the emperor heard about this he was furious that Valentine was still making converts even in prison, so he had Valentine beheaded. Valentine knew that he might get caught in his Christian activities. He knew that if he told the court the truth about the Roman gods that he would be thrown in prison. And he knew that if he continued to witness to Christ in the prison he would make his captors angry. But he continued, because he loved the Lord and his fellow humans. He was willing to risk his life to free the prisoners and spread the Good News of Jesus Christ to those who needed to hear it. The Bible Says: "No one has greater love than this, to lay down one's life for one's friends. "(John 15:13) God showed us this love by coming in Christ to die for our sins. And St. Valentine demonstrated this love when he died for his friends. This is the kind of love that Valentine's Day is really about. We have lots going on here, as usual! But, today was a restful day to gear up for tomorrow and the rest of the week. Started laundry tonight. I don't think I've mentioned on here about my plan for laundry. This is our 4th week to do laundry this way and I'm still loving it. What do they say about doing something that you really just can't stand doing? Eat the frog! Well, I eat the frog every Monday with my laundry. I do laundry all day on Monday so that I don't have to touch it for the rest of the week. I can't say that the once a week thing is helping in any other area (i.e. cleaning the house), so I'm going to have to go back to another system for that. But, for laundry - it is working! And I'm on a new Creative Team! My friend Brandi sent me a link to Simply Susan Godfrey's blog and mentioned that she was having a CT Call. I immediately loved what I saw. Her designs were beautiful, but better still - she's a Christian woman! She sells at several different stores, including Faith Sisters, which is a Christian digital scrapbook site. She checked out my gallery and immediately invited me to be on her CT! Wow!!! Susan is a kindred spirit. Found her on Facebook, too. Ahhh, facebook. Gee! As if I don't have enough things that I'm highly addicted to my sweet hubby tells me to check out facebook. Before I know it, I have 40 friends on there! Mostly friends from high school and some from church. It's so nice to catch up with people and see what is happening in their lives, but I have to say that it is one of those things that I will most definitely need to say "no" to at times. Our homeschool valentine's party is this Friday. I'm heading that up with lots of help from all the moms! Should be a wonderful time for us and our children! I started scanning more pictures for my parents album tonight. Got 3 more years in! I've decided that I'm just going to finish scanning everything in before I make any more LOs. Eating the frog... eating the frog! That scanning bit is almost torturish! Still working through all the curriculum choices. I've made a couple of decisions and will share those soon. I wanted to give a quick update on where we are on this process of narrowing down curriculum. Below are the results from another awesome chart that Mrs. Duffy put into the 100 Top Picks book based on our educational philosophy. I put them into a new chart that I could use as a book mark as I read the reviews in the book. I love that this is a whole process because I can't imagine reading every review, since so many of them wouldn't work for our children or our family dynamics. I skipped phonics at this time, because we already own our Kindergarten curriculum and I didn't feel this was a pressing need. Also, some of these picks are for one child or another and not necessarily both. Since C.13.B. will be in 8th grade next year, we are moving to more independent study for some subjects. And lastly, we already have a foreign language that we love - Rosetta Stone - which happened to meet all of the criteria for our learning styles and family. Well, I guess that was almost lastly - we are currently using My Father's World, which happens to use a lot of the recommended resources for our family, in a scheduled format. Okay, really lastly, Mrs. Duffy has updated some of her top picks information as well as added other reviews on her website, which include Teaching Textbooks and the Young Explorers Series from Apologia, both of which we are seriously considering. I'm comparing these things and also checking out each subject area on Cathy Duffy's website for additional options. Although this may seem like an overwhelming list, I'm so excited that we are homeschooling in a time where there are options besides Abeka and ACE. How blessed we are that we are not pinned down to one particular curriculum because of the freedom that we have to homeschool. Freedoms that have been purchased at a price by our seasoned homeschool parents - thank you for those sacrifices you made to stand up for Christ to bring a freedom back that was a norm at one time. Thank you! Are you participating in Project 365? If not, jump on board. I was debating back and forth about doing this, but tried to take a pic a day just in case. As I thought about it more and read more about it, I realized I really needed to do this - to capture the everyday that is our life. The simple things are what make our journey so full. It's not the major events that we forget and want to remember, it's the little stuff we tend to forget about. So, instead of going all the way back to the beginning of January, I started with what I could right now and here is my first Project 365 LO. 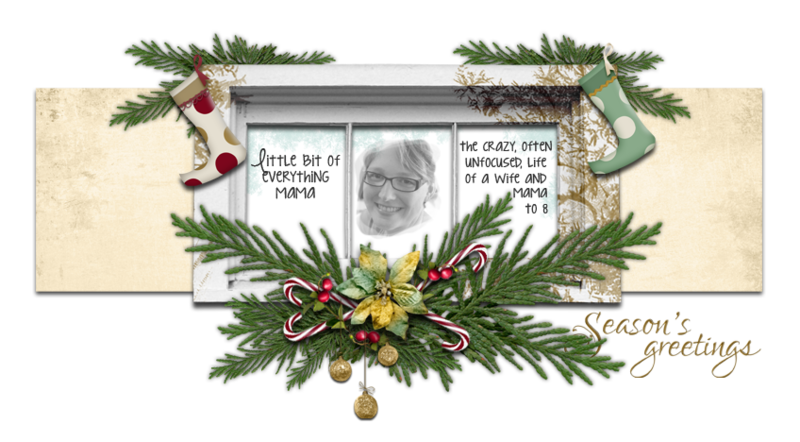 I used the Life 365 Kit from Gina Marie Huff at Weeds and Wildflowers because it looked like the simplest way to get it done. I'll still scrap many other LOs for our other albums - people we love, places we go, who we are, and things we do - but I want a 2009 book comprised of the everday!